US$2B from Wainhouse: "The industry crossed the $2 billion dollar mark for the first time ever." TeleSpan and Wainhouse were reporting group system endpoint revenue. IDC was including infrastructure, e.g., multipoint control units, and Infonetics also included PBX system revenues. With these explanations the numbers seemed consistent with each other, but still higher than I expected, so I kept digging and found better understanding. For sake of simplicity and consistency, it seems easiest to focus on group system endpoint revenue. Elliot Gold kindly provided me figures for group systems revenue back to 1989 and those figures are now included at http://vidconf.net/. Those revenues confirmed my impression of industry stagnation and decline from 1996 to 2006, and also provided new insight. As I thought, 1996 was the best year before 2007: 1996 group system revenues were US$719M. From 1994 through 2006, the average yearly group system revenue was US$661M, with a low of US$571M in 2003. The industry started growing again in 2007, with group system revenue of US$1.038B that year, US$1.259B in 2008, US$1.273B in 2009, and US$1.425B in 2010. Those revenues yield a 46% jump in 2007, 21% growth in 2008 and a 44% increase last year. However, there was (merely) 1% growth in 2009 and 12% in 2010. Starting with the US$3B figure and assuming 20% year to year growth through 2016 leads to US$22B total from 2012 to 2016, but history and recent company and industry reports can lead to skepticism about 20% growth rates. On the other hand, at least one prediction suggests dramatically higher growth, to US$10.8B in 2015 alone. Some of the skepticism is not new. Many of the points made in Videoconferencing adoption not near 'tipping point' were made, or could have been made, in the 1990s. The cautions expressed in 5 Reasons Cisco And Polycom Are In Trouble In Telepresence are much more specific to the current environment and were followed up by Reports of Telepresence Death are Greatly Exaggerated as a rejoinder. interoperability: The two major factions are H.323-based group systems and Skype. Having said that, there are obvious and subtle qualifications, e.g., group systems typically support SIP and some even support Skype. There are other factions, notably FaceTime. The existence of the factions and incompatibilities is a major impediment to adoption and growth. price points: Some, e.g., Bargain Videoconferencing Is Here, cite cost as "The single biggest hurdle to video conferencing's spread". That article discusses price points from US$5K to US$250K. In practice, prices can go higher, while very useful Skype oriented systems with fairly large screens can cost significantly less than US$1K. See Zen and the Future of Videoconferencing Hardware for additional perspective on low cost systems. nomenclature: For some, "videoconferencing", "telepresence", "unified communication" and other names, even Skype, are synonymous. 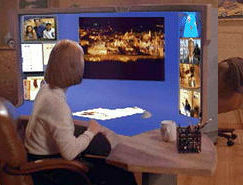 Others take these terms, variants such as "immersive telepresence" and alternatives such as Universal Video Collaboration as being distinctive concepts. Without substantial progress on reconciling these disparities, it is hard to imagine exuberant growth. Rational expectations seem that growth is ahead, but not predictable growth until anyone can call anyone, most people know how to call someone, and many want to make video calls.